Go Mad or Stop Caring: Is that the best you've got?! A 23rd-minute penalty rebound settled Saturday's big game. 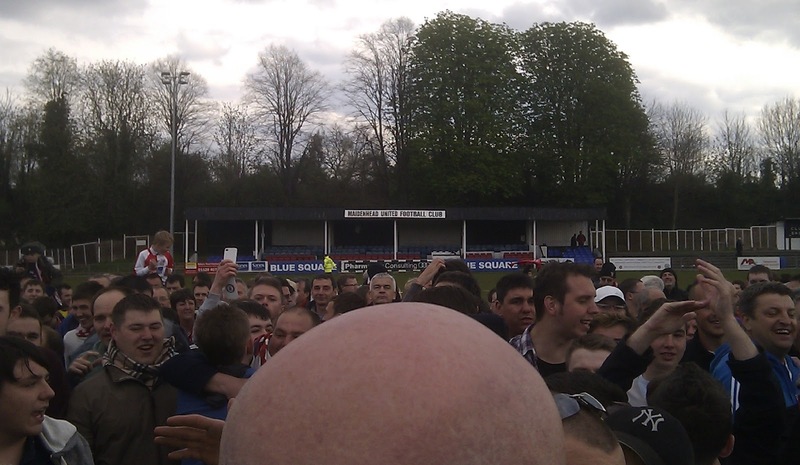 Woking are champions. 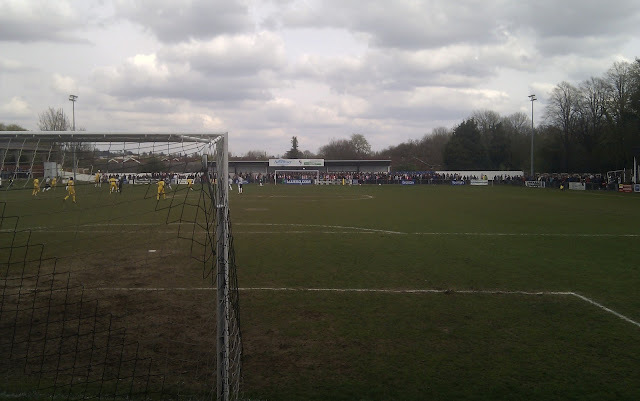 Maidenhead are not mathematically relegated, but Susan Boyle has completed her vocal cord warm-ups. 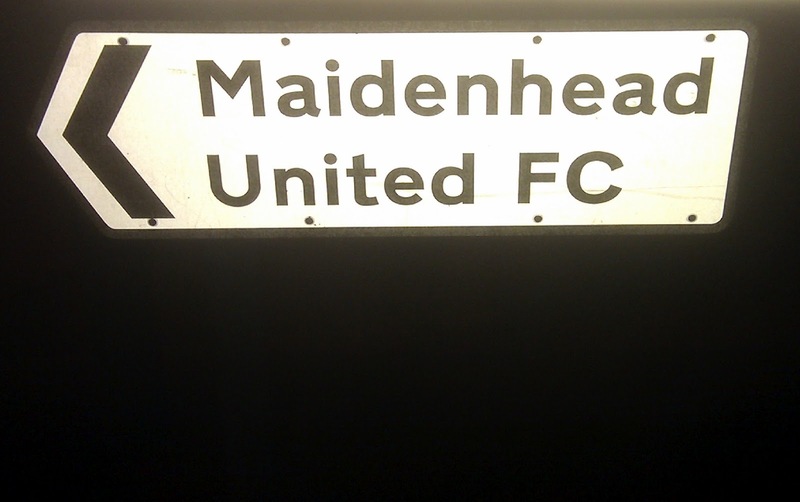 The contest was all but over once the Cards (who - in Windsor Boys' alumnus Adam Newton and ex-Maidenhead Boys player Kevin Betsy - have almost as many local lads from the Borough, in their first team squad, as the Magpies!) had taken the lead. The home side toiled but barely threatened a goal; Daniel Brown's scuffed first-half shot about as close as they came. Garry Hill's team could afford to play with the handbrake on (as Monsieur Wenger would say), resulting in an tepid, uninspiring spectacle lacking quality. Indeed, anyone who ridicules the Southern League for being 'agricultural' should be made to watch a recording of this encounter ... at least the 'hoofball' played in the lower leagues is often effective! Expect the promoted sides to do well in this division next season. The lacklustre entertainment meant that the crowd would have to make their own fun. 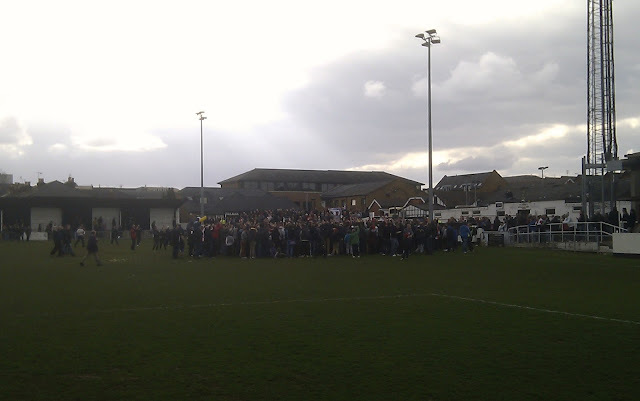 The away fans had brought balloons, other inflatables and, it would transpire, smoke bombs. Macleod (M) and I, meanwhile, were inadvertently stood with members of the MMS, in the Bell End, during the first half; the recently finished Merseyside derby and the impending Grand National dominating their conversation, the possible make up of next season's Southern Premier dominating ours. Then, in the second half, several amusing and self-deprecating chants emanated from the home supporters stationed behind the Canal End goal. I'd like to point out that many of these were started by understandably world-weary York Road regulars, rather than by the KSG. "How sh!t must you be, you lost twice to us?!" and "Binnsy loves his next club" were personal favourites. As for on-field matters, John Scarborough's clumsy foul for the penalty award was rather symptomatic of his afternoon (Andrew Fagan a better long-term option?). Mark Nisbet - still our best centre half - looked somewhat lost in midfield. Ashan Holgate repeatedly dropped so deep that, in effect, Lee Barney was ploughing a lone furrow upfront. (Not So) Super Manny "If he stays injury-free he'll score 15 to 20 goals" Williams - newly shorn - was the second substitute brought on; afforded just nine minutes against his former club. Jonathan Hippolyte was an unused sub; nothing against the young man, but is he really the best striker in the Reserve/Youth team set-up? Martel Powell was lively enough, TBF, but it is not hard to see why the Magpies have scored so few and conceded so many, nor why fans' favourite Bobby Behzadi and goalkeeper Billy Lumley are likely candidates for the Player of the Year award (I voted:  Jermaine Hinds  Benny Laryea  John Lambie). The MUSA race night was a success. Congrats to those who made it so. A pity, therefore, that the MUSA Secretary couldn't make it. Probably too busy signing up new members! ;-) Over £650 was raised for the ring-fenced ground improvement fund ... more than enough for another plasma TV in Stripes (to play KISS FM on) or another sign (so that the Mayor might be able to find the ground, without having to ask for directions, if/when he visits again!). A horse called 'Brandy and Cigars' won the final race. No need for either, at York Road, this season. Nor next season, I fear. It's been six years since Maidenhead were last relegated from the Conference South. Hundreds of thousands of pounds have been spent in the meantime. For what gain? The team and pitch are as bad now, as they were then. Any (minimal) improvements to the ground were likely paid for by MUSA. The average attendance is only up (by a small amount, if at all) due to the considerable away followings brought by the likes of Woking. The Youth and Reserve teams seemingly only exist to provide players for other clubs (if anyone at all; someone mentioned at the weekend that Jake Chance has quit football). Debt free? Undoubtedly a good thing. Aside from that? A promotion (which looks more and more like it was a fluke), a Berks & Bucks Cup win (meh) and an FA Cup replay against a League side that we have played nearly 20 times in recent years? Try and spin it whichever way you can, dish out the 'anti Drax' and 'anti club' labels - plus the bans - if you must. The inescapable truth is that it all looks like a monumental - and rather sad - waste of time and money. Not my money, thankfully. And increasingly, not my time either. GMOSC.